Jodi Bova-Mele in Lizzie Borden Took an Axe. Photo by Abel Phillips. BOTTOM LINE: Everything you always wanted to know about the notorious suspected murderess; comprehensive if not exciting. Heater directs his own script, and the results are mixed. For a play building up to a heinous double murder, there is surprisingly little forward momentum. It seems clear that Heater is in the “she did it” camp (Borden was actually acquitted of the killings, though no one else was ever prosecuted), but despite her numerous potential motives -- greed, fear, revenge, insanity -- the crime never feels inevitable. However, there are moments of keen psychological insight, such as the scene that shows Lizzie (Jodi Bova-Mele), post-murder, manipulating her friend Alice (Maya Dwyer) so that the latter’s suspicions are confused and transformed into guilt. 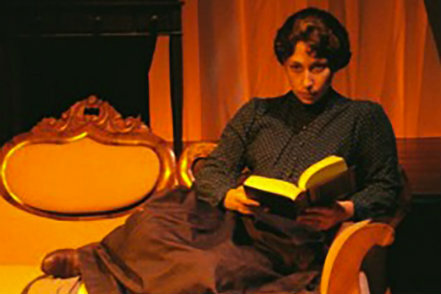 Notable performances are given by Carmen Viviano-Crafts as Lizzie’s demure but bitter sister Emma, and Sara Weiler as the much-abused housemaid who might have been the key to unlocking the mystery. Blending scenes of domestic life, monologues, and voiceovers of excerpts from the trial transcript, Lizzie Borden Took an Axe has all the building blocks for a riveting drama. It never catches fire, but for lovers of unsolved mysteries and classic Americana, it might prove diverting.